Interleaved practice seems (and is) random, and random is not efficient...or is it? Recently I've noticed a trend where pianists are sharing their piano practice routine with online video’s. This can be very helpful indeed, but what hit me was that so much of the practicing I saw was done in a quick, sloppy, unmusical and almost "hateful" way. It reminded me of my own harmful and time-wasting piano practice routine during my music high school years. The "competition" with my peers about who practiced the most hours, usually wasting most of that time with inefficient and mindless repetition of the same again and again. No wonder that many developed repetitive-stress injuries. Asking anyone if they liked to practice- most would answer usually not. I was a quite shocked to realize how some young pianists still, almost 40 years later, are practicing in the same self-punishing way; without pleasure, musical intent or effective ways. As if practicing is a necessary evil to be able to…what? Play? Practicing the Piano Should be Enjoyable! If most of the time spent practicing is done without any pleasure, even with boredom, and practicing is what you do most of the time- what’s the point? Playing the piano, practicing and performing should be with a sense of joy, curiosity and an ever-exploring mind. Always with a musical intent. Never with boredom and/or pain. This mindset is also the ultimate foundation for learning. Our brains simply do not learn well under negative pressure or boredom. To learn as effectively as possible, we need to have a positive and curious mindset. And loving, loving the music we’re about to learn and play. To save time we need to learn a both effective and healthy piano practice routine, in this way avoiding injury from wasting long hours of wrong practice habits. What is positive is that there is so much research and ideas easily available today, compared to 40 years ago. You can learn how the body works, how to avoid injury, and how to practice effectively, etc. And thanks to new research of how to improve skills in practice, especially regarding sports, we can get plenty of ideas that can be used also for musicians. One "new" strategy I find works very well is random practice, or interleaved practice. Start by dividing your piece with a pencil in larger sections for example A, B and C. Then divide each section in small parts, 1-2 measures each. Remember: Keep a musical intent from the very first note. This will put you in a mindset of always looking for meaning and beauty, and it will always be a joy to play even the smallest bit of a piece! 1. Hands separate: Learn to play with perfect tone, and expression as you learn the notes and the rhythm correctly. Repeat at least 4 times without mistakes, but each time play better and more beautiful than the previous- this is key! 2. Hands together: Now it’s important to play in only half the speed you were able to play comfortably hands separate. This is crucial! You want to avoid making any mistakes at all. Repeat as before 4 times without mistakes and keep improving for each repeat. Never repeat exactly the same- always make it better. This will force you to constantly listen and evaluate. Here Comes the Random Magic! For example, don't start at the beginning. Start with Section B part 3. Then Section B part 1, or whatever in that section- but not in order! Make sure to make a small check-mark for each part after practicing. You are not "allowed" to practice this again until all the parts in this section of the piece have been practiced! After all the small parts have been learned in a random order, it’s time to link these small parts to form larger parts. For ex. If you had 1 measure per part, now combine 2 measures for medium parts. 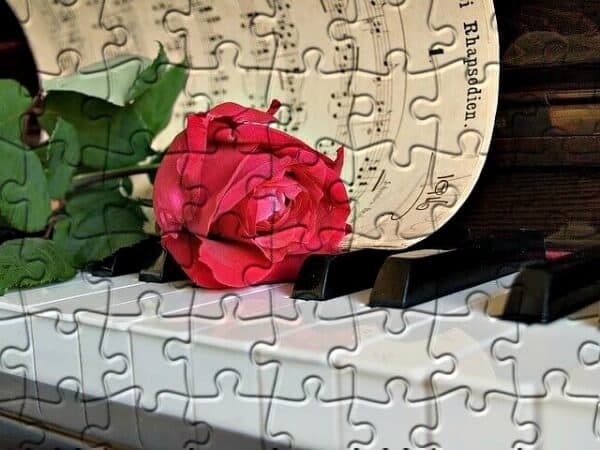 Repeat the piano practice routine above for these medium parts, but always in a random order until you have completed them all in that section of the piece. The only difference is that this time, (after combining the hands together in half tempo) you can increase speed a little for each repeat. Use the metronome to set a goal, and make sure you get all medium parts to the same tempo. Now, depending on the length of the section (or piece), you may need to do this more times, by doubling the measure groups each time. 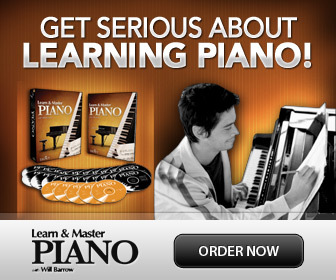 Use the same piano practice routine again, but you can keep gradually increasing the speed now. Finally, play the whole section in the same way; hands separate; repeat and improve, hands together; half tempo, repeat, improve and increase speed and musical expression. Then continue with the rest of the piece in the same way, until all parts from small to large have been learned and combined. By dividing the piece in small sections, then linking with larger and larger sections, you will learn very effectively. By always working to improve for each repetition you’ll never get bored. By not allowing yourself you go back and practice a section twice, you’ll keep all the sections and parts at the same level and avoid mindless repetition. With random practice, you'll always stay curious, because each section or part will have to be approached “from the blue” without any expectation beforehand. This keeps your brain happy! Using this method myself, I have found that I always approach all “bits and pieces” of a composition with the same interest. Each time I start a new "bit" of the piece- it's like the beginning of a new piece! There are no more “dark and obscure corners” in the piece that I have skipped or thought unnecessary to practice. I also notice that I can keep on going forever, since it’s so much fun! So, a caution here, make sure to take short frequent breaks every 20-30 minutes to stretch. This helps not just your body, but your brain too. Learning gets easier with breaks! Tip: There are apps that help you with this, some are even free. Search for "music practice app" for example. The apps can also help you stay organized in your random piano practice routine!